All your FAQs answered for The Uganda Marathon - An Adventure Like No Other! Why should I sign up? What makes the Uganda Marathon so special? You’ll be attending the Best International Running Event and have The Time of Your Life! The Uganda Marathon won “Best International Event” at the UK Running Awards 2016, “Best Marathon in Africa” from RAD Magazine, “Best Marathons 2018: The 9 Races You Shouldn’t Miss” from Red Bull UK, and was nominated for “Best for Poverty Reduction” at the World Responsible Tourism Awards. Our participants are of all ages, come from all over the world and have a wide range of running abilities. You will all come together and forge lasting friendships as you become part of the local community too. Your outlook on life will be changed for the better as you experience our festival of adventure, impact and challenge, with hundreds of fantastic people! Its no wonder 1 in 5 participants describe the adventure as “The Best Week of My Life”! You’ll be visiting the “Pearl of Africa!” Uganda is rated as a massive top 10 bucket list destination. Its home to Mountain Gorillas, Tree-Climbing Lions, rhinos, elephants and more, as well as the source of the Nile (the world’s longest river). So, not only will you run a Race Like No Other, you can extend your adventure with Gorilla Trekking, Safaris, White Water Rafting, and more! Why would you choose anywhere else? You’ll facilitate sustainable international development in a community that needs you: the Uganda Marathon has a year-round presence in Masaka, so you can rest assured that all of your donations will be spent efficiently. We are committed to working towards sustainability, in partnership with the local community, within the United Nations Global Goals framework. So you’ll be leaving behind a legacy for years to come! 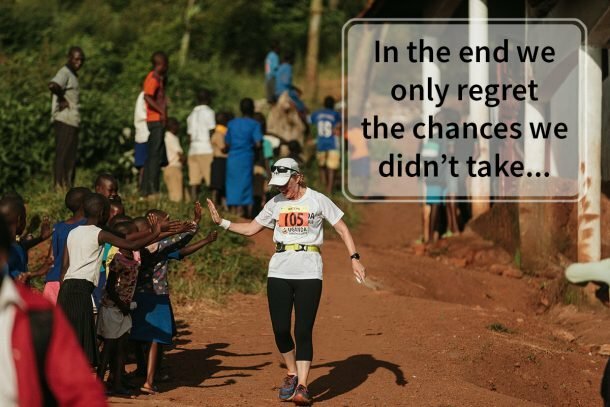 You’ll have control over your donations: the Uganda Marathon is incredibly proud to say that 100% of all funds raised by runners goes directly to our grassroots projects. This is something that makes us very special in both the charity & challenge events sectors. There’s no minimum fundraising target. You get to choose how much to fundraise and which of our project(s) you would like to support. You’ll connect with an amazing community: during your adventure week you will get to visit the projects which you have fundraised for. You will witness, first-hand, the positive impact and sustainable change that your donations are facilitating. Just imagine how you will feel when visiting the projects and connecting with the people whose lives you’re changing! You’ll run alongside 3000 locals! The Uganda Marathon has become part of the fabric of Masaka, and we have 3000 local runners take part on Race Day. You will experience such fantastic comradery, community atmosphere and togetherness that you’ll be running up those hills with a smile on your face! You’ll inject thousands of £££s into the local economy: our economic impact report found that every participant adds about £8,000 worth of value to the local economy, just by taking part! Now that’s an adventure you can really write home about! You can stay in our beautiful Athletes’ Village, created by us especially for you. You’ll be surrounded by like-minded people, enjoy entertainment & campfires every evening, and feast on sensational views over luscious, rural Uganda. What could be better?! What does it cost? How can I sign up? Registration is just £99, payable via our signup page. Your remaining balance is then payable within 60 days. Your balance depends on your accommodation choice: Camping, African Glamping, Hotel. For 7 days and 7 nights of accommodation, food, volunteering, culture, physical challenge, and sustainable positive change, the price cannot be beaten! Make sure you register early for our Early Bird Prices! We process all registration payments with Stripe, an industry leader in payment processing, and our website is secured with SSL – all your information is encrypted and secure. See our Registration Page for prices and how to sign up for the trip of a life time! How much holiday do I need to take for the trip? 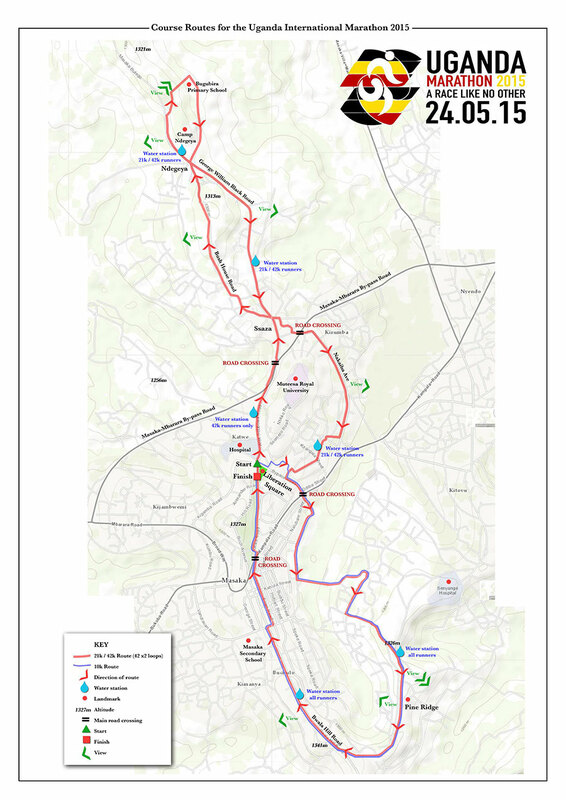 The Uganda Marathon runs between Sunday 26th May and Sunday 2nd June. We have done our best to organise these dates and our Masaka transfers so that you only need to take 1 week (5 days) of holiday from work. On the way to Uganda, you are able to arrive at Entebbe airport any time before 18:00 on Sunday 26th May in order to catch our free transfer down to Masaka. Then on the way back, you can either catch our Sunday transfer that leaves at 09:00am Sunday 2nd June, or if you would like to be back at work on Monday then you can catch our Saturday evening transfer that will get you back to Entebbe airport in time for the early morning (3:00am) flight on Sunday 2nd June. We do of course encourage everyone to make the most of their trip to Uganda. Few people come to East Africa more than once in their lifetime and it is a beautiful country with all the scenery and wildlife that Africa is so famous for. We would highly recommend extending your adventure into a trip of a lifetime with one of our Gorilla or Safari Extensions. What if I'm travelling solo? Each year, over a third of our participants come to Uganda as solo travellers. Every single one of them leaves with amazing new friends whom they have shared a wonderful experience with. If you are travelling alone then do not worry! We have a real mix of people of all ages, from all around the world, with a wide range of running abilities. By the end of the first day you will have met so many other like-minded people around the campfire or around the pool, that you’ll feel as though you came on holiday with 150 friends. In the run-up to your trip, we will put you in touch with any other participants in your local area so that you can meet up for coffee and / or training runs. We’ll be on hand for all of your questions, and provide you with all the information and support that you need (from training plans & tips to support in booking your flights, etc). We’ll pick you up from the airport, make sure you have an amazing time, and then bring you back to the airport on your way home. So, if you want an adventure, but can’t find anyone else as adventurous as yourself to accompany you, the Uganda Marathon is the perfect trip. We support you every step of the way, you will make enduring friendships with your fellow runners, and have an adventure of a lifetime! How old will my fellow participants be? One of the things that makes the Uganda Marathon so special is that it is such an inclusive event. We have a real mix of people of all ages, from all around the world, with a wide range of running abilities. Age is just a number! To date, our youngest participant was just 11 years old, while our eldest participants have been in their 70’s. Every single participant loves the experience and becomes part of the wonderful Uganda Marathon community. Is this a good trip to do as a couple? The Uganda Marathon week is a wonderfully special and unique experience. It’s far away from your average couple’s holiday, but if you love a bit of adventure together then it’s the perfect getaway. Each year, we have couples who come and experience Masaka. They create beautiful memories by meeting the locals, enjoying the sensational scenery and helping the community together. What if I've never run before / How fit do I need to be? You have 10K, 21K and 42K routes to choose from, as well as the option of spectating on Race Day. Our participants are of all ages, with a wide variety of running abilities. Almost HALF of our runners in 2015 to 2018 had never run a marathon or half marathon before. They chose their very first race to be the Uganda International Marathon, incredible! In the lead up to your departure, we are on hand for training support and advice. We have our very own running coach and organise group runs in the lead up to the race. We find that nerves settle down over the week, thanks to the fantastic race-week events, the comradeship of all the participants, and the friendliness of the local community. By Race Day most runners are pretty relaxed. If you have run a marathon before, you will broadly know the fitness requirements. Just expect the altitude, hills and heat to make it a bit tougher than others you’ve run. A good rule of thumb is to add 15-25% on to your best marathon time to get a realistic expectation of your finish time here. Most of our previous runners would recommend not aiming for a personal best. Instead, soak up the unique views, and epic atmosphere with all your new running companions! How safe and secure is Uganda? Around 15,000 British nationals visit Uganda every year and most visits are entirely trouble-free. The marathon week takes place in the beautiful Masaka district; Masaka and its surrounding districts are safe and welcoming. The marathon has taken place for 4 consecutive years, during which no security concerns or issues have arisen whatsoever. Nonetheless, we are vigilant and take precautions to ensure your security and make sure the event runs smoothly. We work with the Mayor, the Police Commander and the senior politicians to ensure that the event, the Athletes’ Village and the hotel are as safe as possible, and are covered by as much security as needed. There is 24-hour security at the Athletes’ Village and the local police force provide security on marathon day itself. If you would like more information or advice on security you can consult your Embassy or the Foreign Commonwealth Office. The 7 day and 7 night itinerary for 2019 is yet to be confirmed but we will be looking to keep a similar structure to last year, just bigger, better and more fun! To give you a flavour of what you can expect, here is our 7 Day Adventure page. Many of our participants want to make the most of their time in Uganda by extending their trip. Check out our Extensions page for ideas on how to turn your week of adventure into a trip of a lifetime with Gorilla Trekking, Safari or White Water Rafting! What will my accommodation be like?! The following two options are based within The Athletes’ Village, which features beautiful views out over rural Uganda, as well as a dining area, bar and access to ‘The Glade’ – a social area with a campfire and where entertainment will be held each night. This is the most basic package to take part in the Uganda Marathon and has you camping in the grounds of the Athletes’ Village. Bring your own tent, bedding and any other equipment, and you’ll have access to toilet and shower facilities. The Athletes’ Village package has you stay in the beautiful grounds of The Athletes’ Village, beneath a roof and four walls. You’ll be given a private room, with a bathroom, a double bed, and full access to the Athletes’ Village grounds. We partner with the best hotel in Masaka to offer a package filled with luxuries, such as en-suite bathrooms, huge beds, DSTV, video, 24 hours room service, outdoor pool, gym and sunbathing area – all situated in a beautiful setting. If you want to do the Uganda Marathon in style, then this is the package for you! For further details, see our accommodation page. You can also see the prices on the registration page here. Your destination in Uganda is Entebbe International Airport. We recommend you hold off on booking your flights until you have decided on how long you wish to spend in Uganda before & after the marathon week – there is just so much to do! Uganda is described as “The Pearl of Africa” with good reason. You have plenty of our extension trips to choose from to make the most of your time in this amazing country, both before and after race week. Flights are usually available for less than £400 from the UK when booked in advance. Other countries may vary: we suggest using SkyScanner.net to find the cheapest prices. If you need any assistance, we can advise you on suitable flights, carriers and arrival times. Arrives at Entebbe Airport around 12:30 – 1:30pm. All transfers outside of these arrival and departure times cost £60 via private taxi vehicle (this cost can be shared amongst passengers). Confirmation of your return flights. Masaka, your home for 7 days, lies 23km south of the equator at an altitude of about 1,150m. It is roughly 3 hours drive southwest of the capital Kampala, and has a population of around 74,000 residents. That’s a quite a cheering committee! The local language in Masaka is Lugandan, but most people also speak English, varying from fluent to basic. Communication is very much part of the fun – we will teach you some basic phrases, and then let you loose! You can check the current exchange rate at: http://www.xe.com/currencyconverter/ It’s best to change currency in country. At the Athletes’ Village you’ll be eating classic Ugandan dishes. All of the food we serve is beautifully fresh and lovingly prepared on site, and is predominantly vegetarian. At breakfast time you’ll be able to help yourself to teas & coffees, fresh fruit, chapattis, and / or a ‘rolex’ – an omelette wrapped in a chapatti with tomato, onion and cabbage thrown in – delicious! Lunch will often be eaten off site at the projects, and will generally include a starch such as matoke (plantain) or posho (maize) with beans, fish or meat, and some fresh vegetables. Evening meals at the Athletes’ Village include BBQs, curries and vegetable dishes. Food at the hotel will be a little more westernised, served in a buffet style. Out and about in town we will take you to local eateries where you’ll sit side by side with the welcoming locals. You will get a chance to sample the scrumptious Tilapia – local fish, freshly plucked from Lake Victoria. We’ll also take you to some of the fancier places to dine – where you can get some western nosh, posh coffees and all. We will provide an enormous amount of free water throughout the course on race day. Soft drinks and alcohol are available to buy at the finish line. Athletes’ Village and Hotel accommodation options come with mosquito nets. We recommend you bring some insect repellent (Deet or similar) with you. If you are camping, you may wish to bring the equivalent and also bring mosquito coils which can be placed on the ground outside your tent and burnt like incense. Most doctors will recommend a course of antimalarials for your visit. There are a number of types and some may be better suited to you than others. Seek advice from your GP or travel clinic, with enough time prior to your trip, as many antimalarial courses will need to be commenced before you arrive. As with antimalarial medication, your doctor will likely recommend certain vaccinations prior to your trip. Please check with a medical professional as to which vaccinations you will need for Uganda, and please do so with sufficient time to receive any courses of vaccines which you may need / want. In order to obtain your visa, you must have received and provide proof of your Yellow Fever vaccination. We will have a team of UK ­trained medics and doctors on site, who are used to dealing with minor cuts and scrapes to preexisting medical conditions. If you are on any medication, please ensure you bring sufficient supplies of this with you to Uganda in case it is not easy to obtain replacements. If you have any allergies please inform us and bring any necessary medication. We’re committed to ensuring this event has nothing but positive effects for the local community, so please help us to achieve this by being considerate and generally lovely. We’re linked with a local recycling startup to ensure our accumulated rubbish is properly sorted and recycled wherever possible. The Uganda Marathon also pledges to offer each participant of the 7-day adventure the ability to offset their personal carbon footprint, caused by participating in the Uganda Marathon, by donating an additional $33 to recycling and tree planting initiatives. You can read more about this here. All our suppliers and partners are vetted and uphold our commitment to contributing to sustainable community development. View our full Responsible Travel Policy here. It’s a beautiful, beautiful route. One lap for the half marathon, two laps for the full marathon. Half a lap for the 10k. Expect mainly off-road: hard baked, red African dirt roads, with a little bit of trail and a little bit of tarmac at the start and finish. You will cross the start line at the convivial Liberation Square with plenty of whooping & cheering! Our 21k and 42k runners head out in the same direction, north of Masaka town. From there you will pass a bustling village called Ssaza and then up along a path to another village called Ndegeya. You’ll pass Bugabira (a school which the marathon is supporting) and likely by this point be joined by local children, running bare foot! You’ll then loop back through more villages with plenty of cheering, until you reach Masaka town again. From there you’ll defeat The Beast (quite a hill!) and head up onto Pine Ridge, where you will be rewarded with unsurpassable views over rural Uganda. You’ll finish the 21k loop by running down a welcomed, gentle slope, all the way back into town. As the volume levels rise you’ll finish back where you started, at Liberation Square! Half marathon runners can rest and celebrate, while another loop for the full marathon runners awaits. 10K runners will start shortly after their counterparts, and follow the second half of the course. You will take on The Beast, gorge on all the views from Pine Ridge, and be cheered on by locals through Masaka town. Expect mainly off-road: hard baked, red African dirt roads, with a little bit of trail and a little bit of tarmac at the start and finish. The surface is perfect for running when it’s dry, giving a cushioned and comfortable running surface. The marathon is taking place as the rainy season comes to an end, but the ground may still be wet in places. The terrain is hilly, and the course includes some assents… but the views from the top are very much worth it! We’ll be at altitude of about 1150m. This isn’t in the bracket of serious altitude training (that starts at around 2000m) but you will likely notice a difference. Coming out beforehand for all the adventure will help you acclimatise a little, other than that our advice for best performance on the day is to stick to a good training plan before you come out, and/or just enjoy the experience! We have plenty of water stations around the entire course. It may be a good idea to bring along a hydration pack (think Camelbak or similar, cheaper alternatives) to ensure you stay hydrated throughout. If you do, test it out before the day to make sure it’s comfortable and doesn’t bounce around or rub (imagine a chafing bag strap at mile 15!). We strongly recommend bringing plenty of re-hydration salts with you to take the day before and the day of the race. The 10k course has 2 water stations, the 21k has 5 and the 42k has 11. You can see the water stations clearly marked on the map at the bottom of our Race page. There is also a bottle for each runner at the finish line. Water is provided in plastic bottles for easy drinking. The bottles will be collected during and after the race by Masaka Recycling Initiative, who work with the local community to recycle these. Running out here before the race is a great way to help you acclimatise to the altitude, as well as stick to your race training plan. We will have a number of runs scheduled throughout the week, both from the Athletes’ Village and Hotel, usually before breakfast. These are kindly hosted by runners from Masaka Running Club, giving you the opportunity to meet and run with local people! The runs will likely be about 5K, as many of you will be tapering – join the ones that fit in with your training plan. Don’t worry – we will accommodate all paces – expect a UGM team member leading and bringing up the rear. And the cherry on top? These runs will give you the opportunity to see even more of Masaka! We will give each marathon runner 9 hours to complete the course. This equates to running at 20 minutes per mile – a slow walk. At this time we will collect any runners who are still out on the course and bring them back to HQ. If at any point you wish to stop, just make it to the next aid station to inform one of our marshals or, if you want to stop right there, let a fellow runner know to inform a marshal. There will be large amounts of marshals on the course, as well as the medics and police. And don’t worry – you’ll still get your medal! We find that when our runners hit the wall, they are spurred on by the exceptional comradery and truly special community spirit. We have a team of voluntary UK-trained medics and doctors on site, who are accustomed to dealing with everything from minor injuries, to pre-existing medical conditions, and marathons. If at any point you are feeling unwell, they are there to assist you. On race day our medics will be on hand around the course: two medics at each of the water stations and four at Liberation Square. We also work with Masaka Hospital to ensure we have enough ambulances and local medical professionals for the day. Fundraising for the Uganda Marathon is a very special way to give. You get to choose which projects you would like to support, and decide how much money you would like to fundraise, and how many lives you would like to change! We don’t have a minimum fundraising target, but we encourage you to try to raise as much as you can. This is because we find that those who do, get the most out of the adventure, truly connecting with the community and the people whose lives are changing thanks to their donations. Money goes a long way in Uganda, and we’re grateful for anything you raise. We ask that you set your own target, based on how much you think you can raise. We will then ask that you try and smash that target! Every single penny – 100% – of fundraised money that you raise is sent directly to Uganda, to support local community projects and development. You will witness, first-hand, the positive impact and sustainable change that your donations are facilitating. Just imagine how you will feel when visiting the projects and connecting with the people whose lives you’re changing! It’s something we’re incredibly excited about, and you should be too! OK, I’m convinced, how do I fundraise? We’re committed to making it easy for you. The first step is to choose your priority project(s) which you would like to fundraise for, and visit when in Masaka. There’s heaps of info available on our project pages to get you inspired. Pick a cause you’re passionate about – not only will it help your fundraising; it will keep you going on race day when you need it most! If you want to also fundraise for another charity close to your heart, you can split the funds between the Masaka projects and your chosen charity up to 50:50! Secondly, Set Your Target – how much impact do you want to have? After that, tell as many people as possible.­ You’re changing lives in Uganda and taking on the challenge of a lifetime – people will want to support you! We’re going to send you lots and lots of ideas about how to fundraise quickly, effectively and with minimal hassle too. The Uganda Marathon works within the United Nations Global Goals framework, with a “Hand Up, Not Hand Out” philosophy. We work in partnership with the local community of Masaka, identifying and supporting grass roots projects. We work towards sustainable development and growth, and endeavour to empower the local community. You can be proud to say that 100% of all funds raised by you and every other runner is sent directly to the local community. So far, our runners have raised over $750,000 – making the Uganda Marathon Uganda’s largest ever fundraiser! Every single one of our runners – past and present – are enabling the local community to work together for positive change. We can’t wait for you to see the difference you’re making, and connect with those whose lives you’re changing! For examples of how our runners’ incredible fundraising efforts helped the Charity Projects in 2018, see this page here. Make the Most out of Uganda with Gorilla Trekking, Safaris, and other Adventures! Winston Churchill christened Uganda “The Pearl of Africa” and with very good reason! This country is stunning with exceptionally friendly locals, and unbelievable wildlife. With areas of luscious rainforest and beautiful savannah, Uganda is home to Mountain Gorillas, Tree Climbing Lions, elephants, giraffes, leopards, rhinos and so much more! To help you make the most out of this wonderful place, we have some incredible adventures for you to choose from. All of them are highly recommended by previous runners, and each are available to experience both before and after the race-week. You might also like to check out this awesome video from Jenny (2016 runner) to help you imagine what your adventures will be like! Mighty Gorilla Trekking and the Great Lakes Experience: Uganda is home to over half the world’s remaining mountain gorillas. These gentle giants are humans’ closest relatives and seeing them in the wild is a breathtaking experience that few get to behold. Trek through the jungles to come face to face with a family of gorillas, and then spend time at the great lake, mounting a bike to cycle up close amidst zebras. (4 days / 3 nights) – from $1638. Mighty Gorilla Trekking and an amazing Safari at Queen Elizabeth National Park: Enjoy an unforgettable 5 days seeing all the wildlife that Uganda has to offer. After seeing the gorillas in the jungle, you’ll head to the savannah plains of the Queen Elizabeth National Park for an authentic African safari – home to 100 mammal and 606 bird species, where you’ll have the opportunity to see elephants, lions, buffalo, hippos, leopards and so much more! (5 days / 4 nights) – from $2076. Build your own African Adventure: Uganda is filled with amazing attractions and beautiful sights to see. Our partners at Go2Uganda can help you put together your perfect trip where you see and do all the things that you’ve dreamed of. Whether it’s a budget backpacking tour across the country or a luxurious holiday, we’ll help you put together something unforgettable! Tempted?! Take a look at our Extensions Page for more information. There are a limited number of opportunities to stay on after the marathon and volunteer with the projects that you have fundraised for. As a general rule this will cost about £40/$55 per day including accommodation, food, transport and donation to project costs. It’s dependent on availability, and please bear in mind that ‘Volunteering’ and ‘Voluntourism’ has historically done more harm than good in developing regions. If you have transferable skills we will possibly be able to match you with a project where you can contribute. However, please be aware there are many fraudulent orphanages, institutions and NGOs that solely exist to attract volunteers for their money – whilst actively promoting unsafe practices, poor safeguarding of children. If you would like advice on how you can contribute, please do contact us. Contact us here if you want to know more about this.